First impressions can so often be deceptive and long lasting. 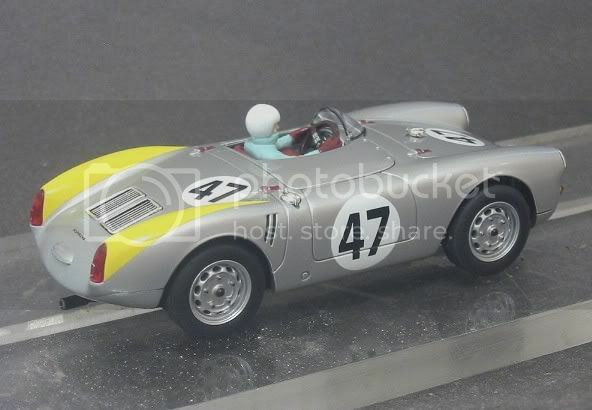 In the case of the Revell 550 Porsche Spyder nothing could be farther from the facts. 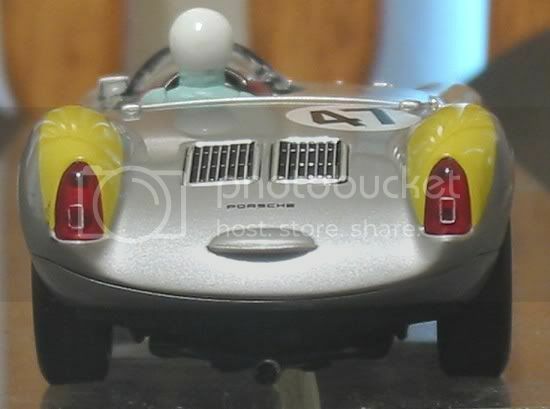 Since I was a very young person, I have had a personal relationship with the Porsche Spyder, never having been able ever to afford a real one, I became the proud owner of the Scalextric Spyder which was to be my companion through my formative slotcar years. It was driven through motor after motor, axle after axle ‘til I was eventually seduced from my native land to some foreign shore by a blonde siren with antipodean’s ways. So, all my toys were packed up and left at mothers ‘til my return. Some years later, on my return to Blighty, I ventured to my mother’s on the pretext of not having seen her and father for several years. Burning in the back of my mind was the desire to see all my toys once more, exactly as I left them in my toy box at my parent’s. Feigning a moment of curiosity with their new home, I went to the spare room and saw the Ottoman that was my toy refuge in the corner of the room. I approached slowly and shaking with anticipation, I lifted the long lid. SHOCK! HORROR! The box was half empty and gone were my prized Scalextric cars! After sedation and several cups of strong tea I asked mother the whereabouts of the missing cars. “ I gave them to your nephews and nieces as they visited over the years love, I didn’t think you’d mind” !!!!!!!!!!!!!!!!!!!!! Since then, on misty days in the half-light of dawn, I have seen Spyders driving past in ghostly formation to taunt and tease me. So I decided to stop these aberrations and my counsellor decided the only way to do so was to replace the cars. The green Aston Martin and blue Cooper GP were simple. The Red Scalextric Spyder has remained elusive and the odd one that does appear seems to be worth the gross national product of a small third world country. The answer came out of the blue when Revell announced their 2004 range in 03. I hunted this one down on eBay a few weeks ago and by the time it landed in Australia, it cost me $58.00 inc. freight. 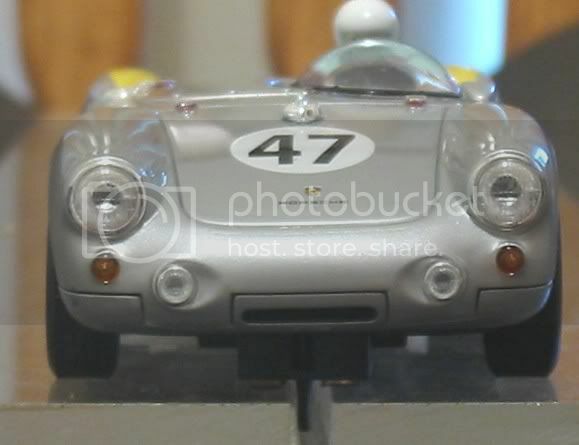 The car is a 1/32 replica of one of four purpose built cars entered for Le Mans in 1954. Originally 1.5 litres, it was sleeved down to 1,089 cc to comply with the class entered. At a rating of 72 bhp (54 kw) and after some unsure moments with engine misfires, it went on to win its class. The model itself is stunning! A lot of thought has gone into the passive parts of this car as would be expected from a company dedicated to static modelling. The striking features are the detail and clarity of simple items like the front lamps. The headlamps and driving lamps have full Freznel detail and anodised rims. The indicators and tail lamp clusters are perfect down to the reflectors and the rear view mirror is silvered! Filler cap and bonnet and engine cover straps are picked out in fine detail. 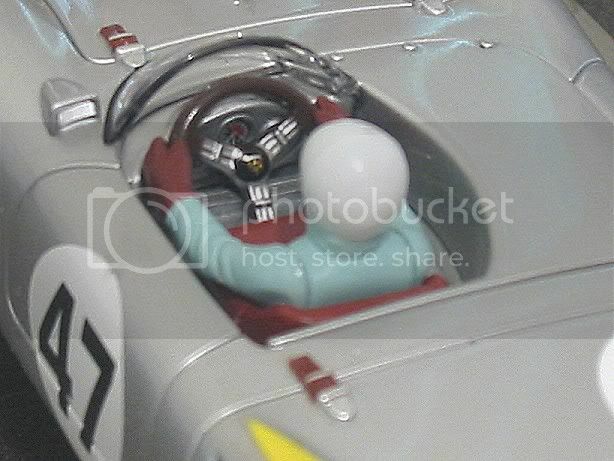 The cockpit detail is good but the front mounted motor only leaves space for a half driver. Louvres and engine vents are crisp and defined. It comes complete with a true to life Siamese exhaust just tucked under the back out of harms way and the piece de resistance for me are the wheels! No, its OK, I’m not cracking up! As a scratch builder I am always looking for true scale wheels for some of the more obscure models I make. These are superb replicas of the 50’s/60’s Porsche pressed steel wheels; there are at least two cars in my collection (Porsche 804 GP and Porsche Carrera 6) waiting for these rims. The finish of the body is first class, no iffy tampo on this car! And, although there isn’t much printing, what there is has been applied meticulously and not a nanometre out of place. First impressions over, it was time to shove some volts into it! Softly, softly, easing the 25-ohm controller into action the car initially showed reluctance to move, then glided almost silently into its maiden voyage. After a few confidence building laps I slowly increased the pace until it was running close to what I perceived to be its max. Next step was to leave braking to the last moment and then bring forward the corner exit acceleration. Eventually the car deslotted in a civilised manner whilst trying to push hard round a standard 180 deg Scalextric bend. 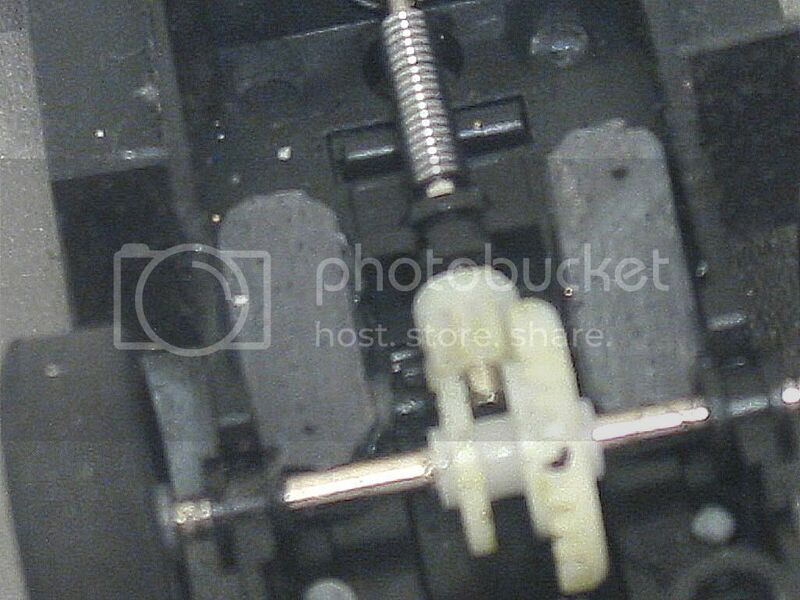 The motor has heaps of grunt for one so small, it is standard Revell fare and through a short spring coupled prop shaft drives a 9/27 reduction final drive. Braking is below long arm motor standards and is a bit behind Scalextric in stopping distance but this can be expected from any upper performance Mabuchi ‘S’ can motor. It does eventually slow and the variable traction magnet in front of the rear axle does an admirable job of keeping it in the slot. As a consequence, corners can be hit quite hard from close in braking. Speed through a corner is a little unpredictable and acceleration from a bend can be initiated fairly early before the exit and it will hold the slot long after some other classic car models are diff up in the landscaping! Mechanically, it combines features from most of the leading manufacturers and Revell have obviously done their homework well since the release of the Cobras. The guide is reminiscent of the tried and trusted Scalextric and SCX guides of the 90’s and is shod with tinned braids. Tyres are good scale reproduction crossplies with the wiggly tread pattern and are 20mm dia. The motor is from the Mabuchi ‘S’ can stable with what I estimate to be about 21,000 rpm top speed. It has three capacitors and two inductances attached which I assume are for suppressing TV/Radio interference. Standard black and red lead wires fixed by push in eyelets to the front of the guide. It has a rigid front axle and axle bushes front and rear are nylon. The traction magnet is of the Carrera type and is front/back adjustable although it is limited to a movement range of about 8 mm. Now, as much in love with this car as I am, I can not ignore the fact that, like all things made by man, it is not perfect and never will be. It was therefore necessary to put my rose coloured glasses away and be subjective for the benefit of a long and happy relationship. 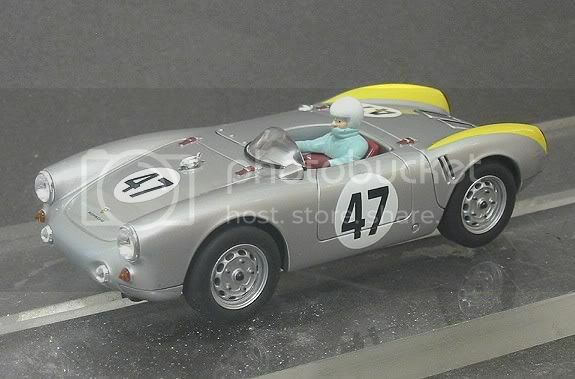 After the honeymoon was over I decided to look upon this Venus in slotcar guise pragmatically and for the benefit of slotting mankind! First annoying habit was difficulty in getting it to corner smoothly especially in tight bends i.e. Scalex inner curves! It had a tendency to stall mid curve at anything less than ragged edge cornering speed! This model carries the vehicle weight on all four wheels and I suspected lack of front wheel differential to be the problem. I removed the front tyres and the problem was resolved immediately. The cure? Lesser people would jack the axle up with foam or some other device to remove track contact or put on hard tyres or paint them with nail polish plus all manner of short term fixes which detract from the outstanding beauty of this model in motion. My cure was the “ Wixle”, a revolutionary conversion of the front axle to allow both wheels to rotate independently of each other yet maintain the rigidity of a fixed axle and retain stability. In simple terms, the front axle is cut in the centre, a small collar with locking screw is mounted over each stub and butted against the inside of the bearing then a short measured piece of 3/32 i.d. brass tube is mounted over both stubs to keep them in line. Also, one of the rear axle mounting bushes has more than its fair share of slop. If this were to be a comp car the bush would have to be repaired or replaced but for a leisure drive it is quite acceptable. No other mods were carried out to this car for home use on plastic and the car drives like a dream, the only other thing I would do for driving pleasure on small circuits would be to possibly put a lower powered motor like an NC1 in. To me, this would enhance it’s ‘feel ‘good’ factor as these classic models really need to be cruised round, not driven at breakneck speed. I’m sure that all the leading manufacturers design and set their cars up solely for plastic track racing and from a business perspective, quite rightly so. There are more than a few racers who would like to put their newly acquired models to the test on something more commercial like painted board surfaces. This type of track is also gaining popularity as a home circuit set up because you can get 30%+ more track in the same space and build it for a quarter the cost of a plastic track. To complete this review I decided to put the car through its paces on a 25 metre painted board track. This surface is unforgiving and if a car has any remaining faults, this will reveal them. The first problem was the cars reluctance to accelerate hard and smooth from standing and from the exit of bends. This was expected as the car is a front engine model. The hot glue gun was plugged in and while it was warming, a couple of billets of lead (about 15 gms total) were cut from a sheet of plumbers flashing, shaped and fitted to either side of the prop shaft rear mount (above the traction magnet). Using tweezers, these were glued into place. Testing showed this to be the solution, there is still a slight amount of tail wagging in corners but for a leisure drive I find it quite acceptable. More weight would rectify this. The other main fault was the tendency for the car to deslot on hard corner entry, something not experienced with magnet tracks! The guide was checked in an acrylic test slot and it was found to be high! 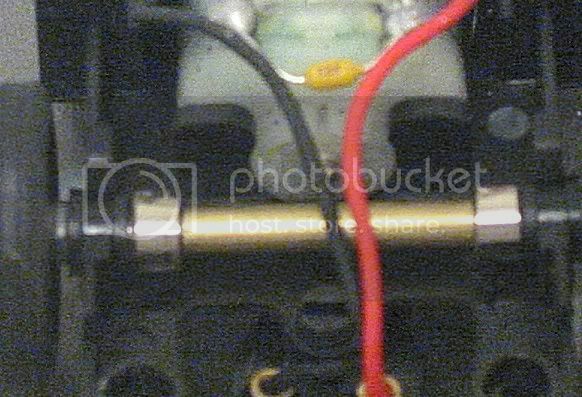 A lot of plastic slot car tracks have the conductor rails higher than the track surface. There are good reasons for this, one being to ensure the braids aren’t held off the conductors by the surrounding plastic. So, cars which run on all fours are designed to compensate for this and many commercial offerings have a guide which sits high in the car. Board tracks have either recessed braid or tape conductors, both of which have a negligible height difference from the track surface. This car has a vertically floating guide and with braid tension it can sit quite high in the slot. As little as 3mm left in the slot does not make for good handling. I made a 2mm plastic collar from some tubing and placed it over the guide locating pin and the guide now sits firmly in the slot to its maximum depth while still allowing the car to run on its wheels. Some people consider that cars should only run on the guide and back wheels. This used to be the case for non magnet racing but has never been the case for traction magnet cars. I have tested the Scalex trans am cars and they are measurably slower on the straight when running with the weight on the guide. The last observation would be that the chassis is a bit too snug and rigid in the body. 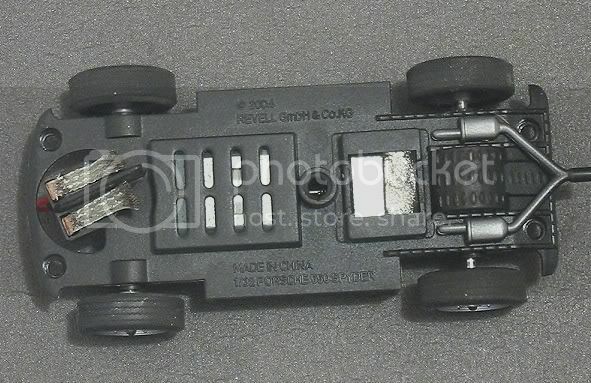 Revell have made a very ‘busy’ chassis with lots of reinforcing and tight fitting mounting pillars, for those that like to loosen a few screws to race then this is a challenge. You can take all the screws out and still it is fixed firm, further hacking at the screw mounts and chassis edge will be required to get any semblance of movement between body and chassis. 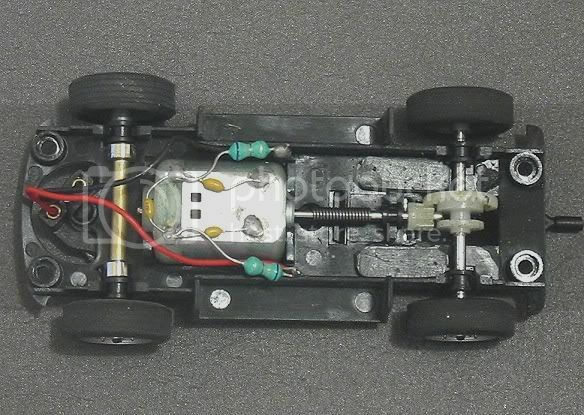 There is also a tendency for the chassis to bow a little when fully tightened as it pinches against the motor and its wiring. This is by no means a definitive review and some of you may feel the model needs further modification for your particular style of racing. So be it but for me this car was almost a dream from the box and is now ecstasy! And the hallucinations have stopped!